Looking for a better RADIO REMOTE CONTROL? Trident radio remote controls provide machine operators with proven reliability and superior performance to get the job done — no matter what the conditions. The Aarcomm Aftermarket Kit (which includes the revolutionary Trident Control System) gets you up and running with the top performing radio remote control on the market. You don’t have to change existing wiring making it very easy to install. Just plug and play and get back to the job at hand. 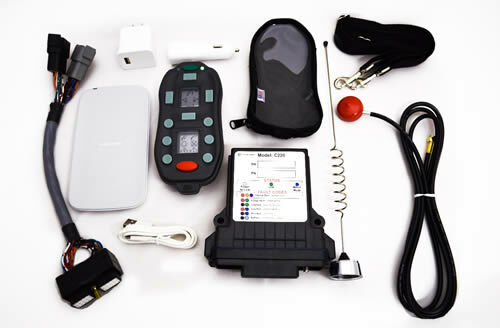 The Aarcomm Aftermarket Kit provides plug and play installation that will have you up and running in 5 minutes. Simply remove your existing receiver, plugin the Aarcomm receiver, and get to work. It’s as simple as that. More rugged. More reliable. More range. And a whole lot less downtime. The Trident System is compatible with many brands of hydrovac excavators, combination sewer cleaners, and jetters including Sewer Equipment, Ram-Vac, Foremost, Tornado, Premier, Hi-Vac, Aquatech, GapVax, Vac-con. The Trident System is compatible with concrete mixer trucks from McNeilus, London Machinery Inc., Con-Tech and line pumps from Putzmeister, Schwing, REED, and more to come in the future. Get a Trident System configured just for you! Learn more about Trident’s features, technical specs and 1-day replacement guarantee.